One of the most frequently asked questions is “What time is the last train to…?” or “When does the MAX stop running?” Unfortunately, that’s not an easy question to answer – it depends on what day it is, where you are, and where you need to get to. So here are the times for all of the last trains, effective as of March 6, 2011. Here’s a Google Docs spreadsheet of this, though I don’t know how readable other people will find it. If you’re starting from Cleveland through 102nd heading west, the last train to Hatfield departs Cleveland at 11:14pm Mo-Th, 11:48 Fr, 12:02 Sa, and 10:47 Su. On Fr-Sa, the last train from Cleveland to Willow Creek departs at 12:32am. The last train from PDX is at 11:49 every day of the week, which becomes a Blue Line at Gateway at 12:03. Mo-Th this terminates at Elmonica at 12:59. Fr it continues to Hatfield arriving at 1:18am. Sa-Su it terminates at Willow Creek at 1:01am. The last train from Clackamas to PSU departs at 10:44 Mo-Fr and 10:52 Sa-Su. Every train departing Clackamas after this becomes a Blue Line to Ruby Junction at Gateway. The last of these departs Clackamas at 12:31am Mo-Fr (departing Gateway 12:52 and Ruby 1:09) and 12:32 Sa-Su (departing Gateway 12:53 and Ruby 1:10). The last train from Expo to PSU departs 11:21 Mo-Fr, 12:39 Sa, and 11:29 Su. The last trains that depart Expo every night turn into Blue Lines at Rose Quarter (these are also the last Blue Line trains that run as far east as Ruby). Mo-Fr, these depart Expo at 1:02am, depart Rose Quarter 1:23, and arrive at Ruby at 1:54. Saturday depart Expo 1:33am, RQ 1:55, Ruby 2:28. Sunday depart Expo 12:39am, RQ 1:01, Ruby 1:17. The last eastbound trains that can get you to Cleveland all depart from Hatfield Gov Center – 11:20 Mo-Th, 12:31 Fr, 12:32 Sa, and 10:36 Su. The rest of the trains departing Hatfield terminate at Elmonica. The last of these are 1:03 Mo-Th, 1:47 Fr, 2:01 Sa, and 12:39 Su. The last Blue Line trains that can get you as far as Ruby all come from the last trains from Expo (see previous paragraph for times). 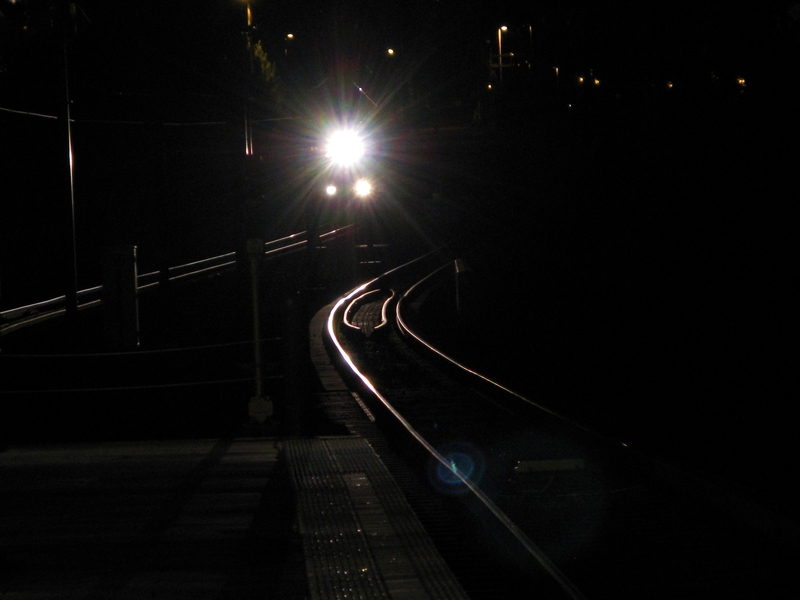 The last train to PDX departs Beaverton TC at 10:08 Mo-Fr (arriving PDX 11:08) and 10:21 Sa-Su (arriving PDX 11:22). The last train to Clackamas departs PSU 11:35 Mo-Sa (though it arrives at Clackamas 2 minutes later on Saturday) and 11:36 Su. On weekends, the last trains from PSU become Blue Lines to Ruby at Rose Quarter. Saturday these depart PSU 1:21, Rose Quarter 1:37, and Ruby 2:10. Sunday depart PSU 12:29, RQ 12:44, Ruby 1:17. The last trains to Expo depart PSU 12:18 Mo-Fr, 12:38 Sa, and 11:27 Su. Every effort was made to ensure the posted times here are correct, but if you find an error let me know. For customer/riders, it would be nice if these times were simpler. I wonder how much it would cost to add one more train of the night, so they could advertise that the last train was after midnight, on every line? A last train at 12:10 to 12:20 would be great, esp on weekends. Actually, after 2 am would be great on weekends, to help prevent drunk driving, but that might better be provided by night bus service. Yup. I’m guessing the State prefers the revenue generated by drunk weekenders and would much rather the lines shut down sooner than later. What time is the last max from the expo yellow line to elmonica ? There isn’t one, if you need to go west from a location on Interstate you’d have to transfer to a westbound train at Rose Quarter. Yeah it’s the dumbest thing that they shut down before 2am on Friday and Saturday night. Last train should be started at 2am. In NYC they are smart to run late and even in Barcelona they run late to make sure people get home safe. Here they seem not to care about people!